Meditation, yoga, mindfulness… You hear a lot about these things nowadays. I see many people struggling, because they have to go to yoga, because it’s good for them. Do they really like it? Of course many do, but in some cases I’m not sure... I also hear people say that they want to meditate, but don’t have the time, or they don’t have the patience to sit down and quiet their mind. I used to be like that as well. I knew meditation was good for me, because hey, it’s said to relieve stress levels in your body and improve your health. I for sure wanted that! I used to be very easily stressed and I thought that meditation might be the answer for me. But I just couldn’t put myself to meditating. So then I started feeling bad about myself, because I knew meditation would help, yet I still didn’t do it. Didn’t I want to feel better? Of course I did! Only just sitting and trying to be silent is not my thing. First of all, I’m not a silent person, which of course is even more reason to be silent every now and then. I do that my way, having my moments of silence. Just being, doing nothing. Mostly just looking around. Second, I don’t sit and meditate in that way. It just doesn’t make me happy. And I try to choose to do things that make me happy. Everything is a choice and I like to ask myself the question: “Does it make me happy?”. I have known guided meditations for a long time already. I have some cd’s and the meditations are very good, only… most of the time I don’t feel like taking one hour to listen to it! I’d rather have them short and sweet so it’s easy to take a little time to listen to them. Sometimes I listen to a (short) meditation daily, sometimes less often. The thing is, it’s not such a big thing anymore. Listening to meditations is easy now. Does it make me happy? For sure it does! Listening to a meditation, even a short one, helps me to relax at a deep level. I think of nothing and let the voice guide me. When I lie or sit down for a moment, listening to a guided meditation that takes me to a magical place, afterwards I feel like my energy has been recharged. It might be the relaxation, maybe because my mind is more quiet, but I always feel more calm and centered afterwards. Probably all other 4 benefits have a part in this one, but since I started listening to meditations again I fall asleep more easily. Especially if I listen to one just before going to bed. And yes, I get up more easily in the morning, yay! And don’t forget that all these things will help you create more magic in your life! If you are more relaxed and have more energy, things go more easily. Magic will start to happen! Of course this is all my personal experience, but chances are you’ll experience the same kind of things. 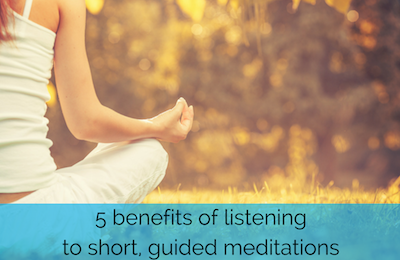 I would love to know how you feel after listening to a short meditation. Please let me know! If you'd like to listen to short guided meditations too, you can click here to dowload my free Healing Tree Meditation.